When you click Buy Now for Mac!, order processing is conducted by our online reseller Paddle.com. Paddle.com is the Merchant of Record for all our non-Mac App Store orders. Your Forms, Designed Your Way. Use our built-in design tools to create your own custom forms or get started instantly by choosing from our selection of ready-to-go form templates. No matter what your needs, our simple yet powerful solution will help you create forms that allow you to efficiently track, manage and maintain your data. Within minutes of downloading the Tap Forms app, you can have your own forms built, designed and ready for data. 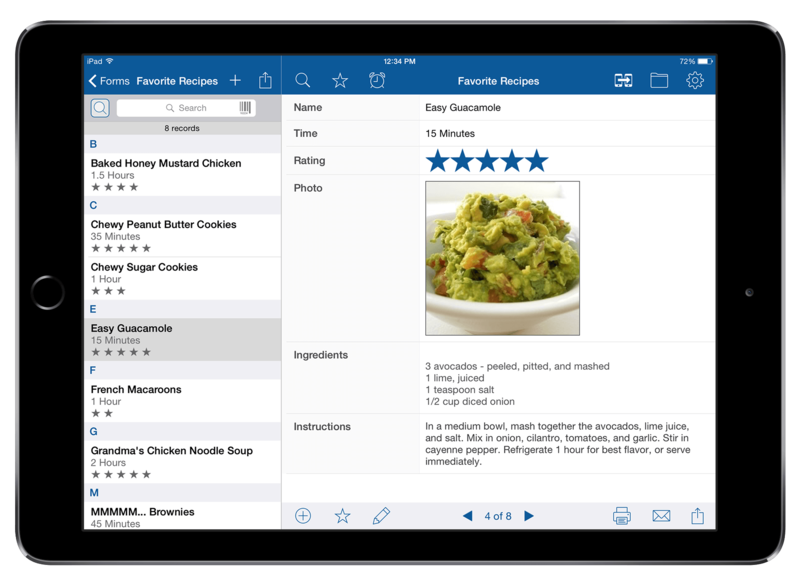 And with more than 20 different field types available, you can build anything from an advanced customer relationship management tool to a simple recipe index of all your favourite dishes. 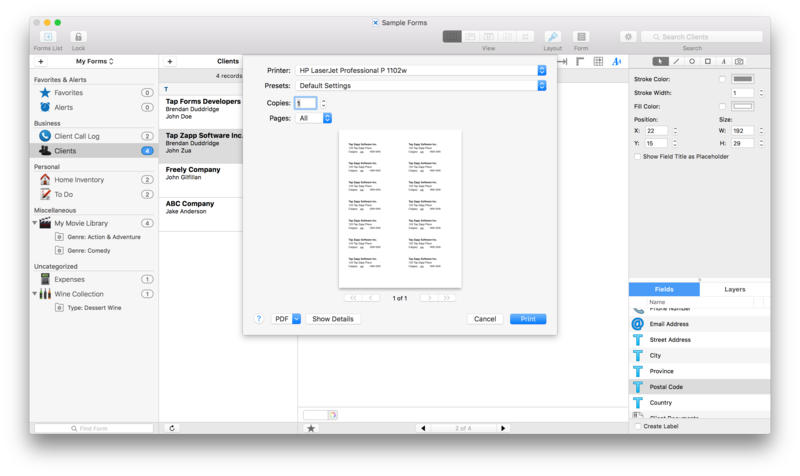 Using the custom layout designer on Mac, you can generate printable labels for any of the data stored in your form fields. With over a thousand Avery® label sizes available, you can quickly and easily create and print any quantity of labels, no mail merges or data sorting required. Print address labels for clients, or print price stickers for new merchandise to efficiently track your product inventory. 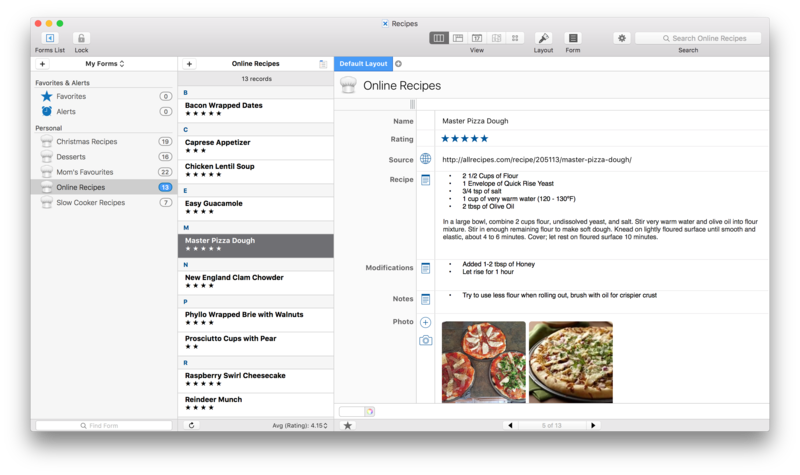 The custom layout designer built into the Mac version of Tap Forms allows you to showcase your data differently for digital and print. For instance, you can create printable summary reports to share with your clients, while viewing a more detailed report on your Mac. Making the switch from Bento to Tap Forms? 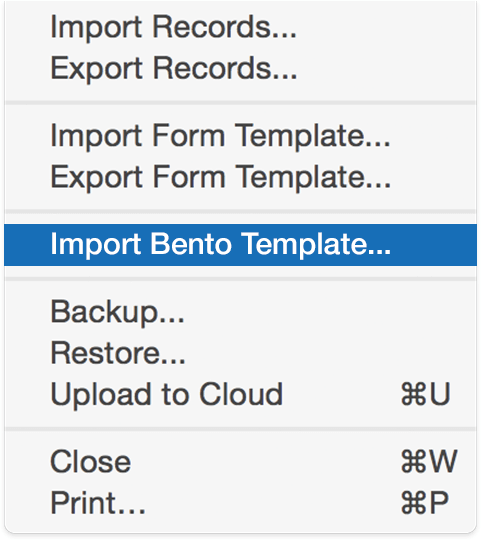 Using the Mac version of our app, you can easily import your existing Bento data by simply selecting your template file exported from Bento. We take it from there. Tap Forms 5 now has a document based interface that allows you to keep your forms organized into multiple database documents. You can even sync each document independently of the others. 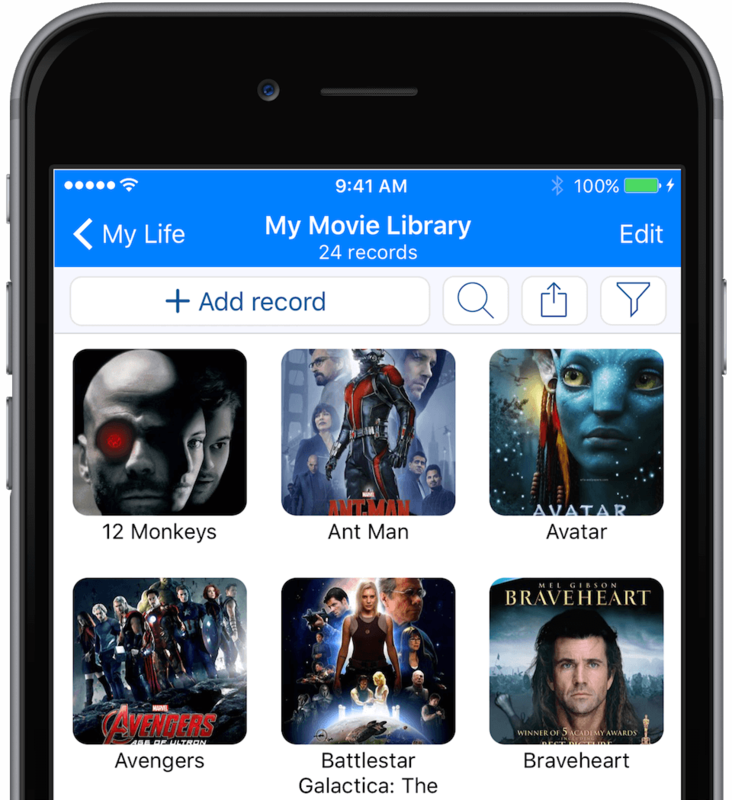 So you can sync your family to-dos and movie library with your better half, and sync your work forms with your co-workers. Or you can keep some documents just to yourself and sync only with your own devices. Using a brand new peer-to-peer sync system, you can now sync your devices without the cloud. Any device that's running Tap Forms on your own private network that has the same document open at the same time can sync effortlessly. As you make changes on one device, those changes are automatically synced to your other devices. 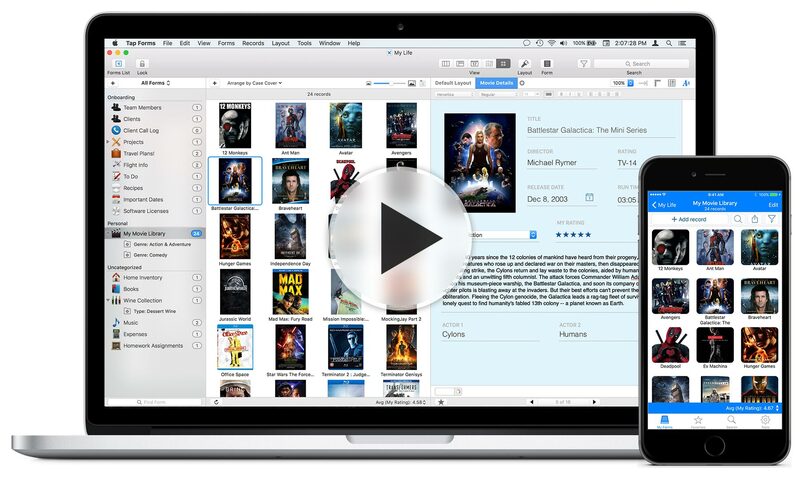 Syncing with the cloud just got a whole lot easier. Tap Forms 5 now uses IBM Cloudant to provide you with fully automatic sync in both directions. That means if you're out and about and make a change on your iOS device, when you get back to your Mac, those changes will already be there. And if you make changes on your Mac, those changes will automatically appear on your iOS device after a few moments. The new Photo Grid view for iOS and Mac let you see your records in an all new way! This is perfect for organizing your movies, music, books, or art collections! Or really any kind of data that has photos attached to it. It's perfect for real estate agents too! New! World Map View (Mac only). The new World Map view enables you to see your locations plotted on a world map all at once. Each point on the map represents a location associated with the records in your form. You can even filter your records by area, view a standard map view, a satellite map view, or a hybrid map view. New! Calendar View (Mac only). The new Calendar view makes it easy to see how your records are organized by date for the displayed month. You can easily see your records grouped into each day, switch from month to month and filter your records by day or by multiple days. The new Signature field type was designed specifically to make it super easy to capture and display signatures on your iOS devices. And with sync enabled between your devices, the Mac version will display the signature on your record moments after you've captured the signature on your iOS device. Now you can search for records that match Any or All of the search rules specified. You can also search for records with dates that occur on or before today or on or after today. Great for keeping up with things to do. On Mac you can choose between a light theme and a dark theme. On iOS you can choose from a wide variety of colours for the navigation and tool bars. Pick Lists can now be displayed as either single-value popover views, multi-value popover views, combo boxes with auto-complete, or regular pop-up buttons (Mac only). A Pick List can also now be configured to obtain its values from a field in any form. The values available in the Pick List are automatically updated as you enter data into the field specified. For each Photo field, you can now add multiple photos to the same field. No more need to create a new field for every photo you want to add to your form. New! Share with Nearby Devices. It's like AirDrop for databases. Just pick a database document, click the send button and choose another device that currently has Tap Forms running and send away. Now you can encrypt not only the data within your database, but also your photos, file attachments, drawings, and audio recordings. Enter your data faster than ever using our spreadsheet-style view. Click a cell in any row or column, and you can type and tab your way to the next field. You can also quickly duplicate values across fields by clicking and dragging to other cells. Tap Forms offers built-in support to help you quickly and easily make complete backups of your data. Best of all, backups are compatible across all versions of Tap Forms, so you can make a backup on your Mac and later restore the backed up data on your iPad or iPhone. Import from Bento, Taap Forms archives, Excel XLSX files, and CSV files. Tap Forms supports a wide variety of file encodings, date and time formats, and column delimiters, making importing and exporting data files a breeze. Add Tap Forms to your daily workflow and see for yourself! Tap Forms for iOS supports barcode scanning for both data entry and searching! Using the open-source ZBar scanning library, Tap Forms currently supports the following barcode formats: EAN-13, UPC-A, UPC-E, EAN-8, Code 128, Code 39 and QR Codes. Additional symbologies will become available as they are added to the ZBar library. Storing confidential data? Want to make sure no one can access your data while you’re away from your desk? You can set Tap Forms to auto-lock when you’ve been idle for a set period of time and can even require Touch ID or Face ID to access data on your iPhone or iPad. With an advanced formula editor, Tap Forms allows you to create custom formulas for your exact needs. You can also have Tap Forms display an aggregate calculation from a set of records in order to get totals, averages, minimums, or maximums from a set of records. Print reports in a variety of formats, including tabular, default, and custom layouts. Print settings can be saved to any number of print presets. How Our Fans are Using Tap Forms. "Tap Forms is a great choice for a database for a small business. I am a small business owner, and for years I used a FileMaker Pro database that I designed. But that application has become far more advanced than I need and way too expensive. Tap Forms has been a great replacement, and is ready to use once installed on your computer. It was easy to export an Excel file from FileMaker Pro and import the file into Tap Forms creating my database. If you want to create a new database Tap Forms has a number of templates to choose from or you can design your own. I have a travel business and book tours and cruises. I use Tap Forms to keep track of all my clients and prospects contact information. In addition, I use the database to keep track of family, friends, and university alumni that I network with. Currently there are more than 1,200 individual records. By searching for a specific identifiers I can select any group I am interested in working with. I use Tap Forms to advertise to my clients and prospects and to communicate with members of my other groups. To any individual or a chosen group I send emails directly from Tap Forms, which works with the Apple Mail application. It is very easy to send eBlasts using this application. For mailings through the Post Office this application has numerous Avery labels for creating address labels. You can create labels for an individual or a group. I print labels with a Dymo printer. It is possible to do this by exporting a CSV file from Tap Forms and using using that file with Dymo software to design the labels. If you have questions or problems the developer, Brendan Duddridge, offers great customer service. I have found him very quick to respond with detailed answers to my questions. " "I design, build and manage a whole bunch of web sites. For all the web sites I manage I need to record all the client details, the web site details and work undertaken during the month. I use Tap Forms to hold all this information so I quickly see how the web sites are configured as not all of them use the same plugins. I also use the web site details to keep a track of my google search terms and page rankings." "I am building a digital family history archive, which I intend to be interesting to my relatives, children, and other descendants. I have mostly photographs, but also a variety of one-page documents including marriage certificates and kids' work at school. All of that can be scanned. I also have some longer texts and text-photo combinations that go in PDFs. To date, I have 1200+ items organized in the archive on my hard disk, and in a website version. Eventually I'll work my way out of my family's paper past into the recent digital past, and start drawing items from my hard drive: iPhoto collection, audio, and video." "I’m a graduate student in history and I use Tap Forms to organize the sources that I find in an archive. Most documents are hand-written, so I retype them into a note in Tap Form so that it’s easier to analyze them." 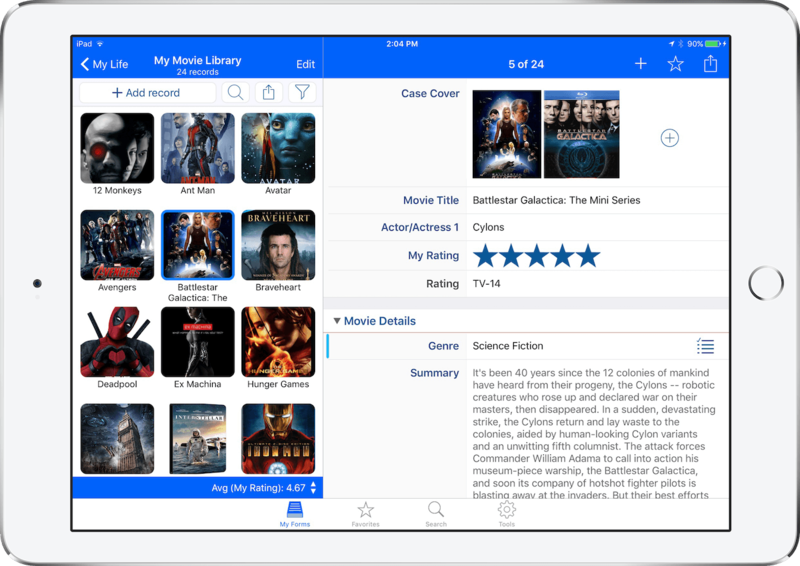 "As a fiction writer, I use Tap Forms to keep track of submissions to agents and editors. I have agents’ names, photos, submission date, current status, comments on manuscripts, submission requirements, and days since submission. I could do most of this with a spreadsheet, but the limits of a table view are too restrictive. Tap Forms gives me the flexibility I want." "I am an Antique Dealer dealing in silver and Jukeboxes and was a great fan of Bento which finally gave up on me. Tap forms has been a life saver, a lot of my stock is out on loan to other dealers in repair workshops and without a database I would not be able to track. Being able to keep related files helps with research on an object and its photographs." "My company provides Tech support and sales for education and SME’s. I’ve used Tap Forms on iPhone for years to record my daily mileage which is then a simple export for my expenses claim. I’ve just created a Supplied equipment inventory – with which I can barcode scan equipment to enter the serial number. This means I can look up any supplied equipment to check warranty details." "I use it every day to run my software and services company. 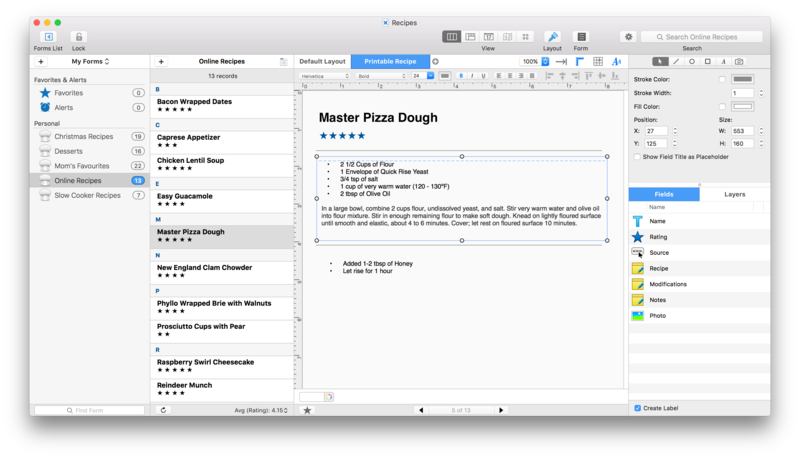 I used to use Bento, then moved to Filemaker, and wound up landing on Tap Forms. Dashboard: The dashboard has my to dos, idea storage, long term things I’d like to do, My sales pipeline summary, things that are ‘floating’, and current project summaries. I look at this everyone morning over a cup of coffee. Contacts: This contact manager not only stores the usual info, but will also keep track of where they came from, if I should keep the contact ‘warm’, amount spent, days since last contact, and the usual notes about the contact. Sales Pipeline: In addition to the usual data in a pipeline (company/person contact data, etc), it will also track stage, probability of close, lead source, contact position, company size, repeat customer, potential value, date added, days since added, date won/lost/abandoned. Project Manager: This is pretty straight forward, but that’s what I love about it. It will track name, priority, % complete, stage, dependencies, project % complete by deliverable, external documents, customer stage sign off, notes (many types), software bug tracking, and more. Invoicing: This is very basic, but hey, invoices do not need to be as fancy as people think. But, in this case it tracks category, description, units, PO#, etc… The usual stuff an invoice should. I print it straight to PDF. Accounts Receivable: Very basic… just who owes us what. It runs our business without breaking a sweat. Love it’s flexibility, simplicity. 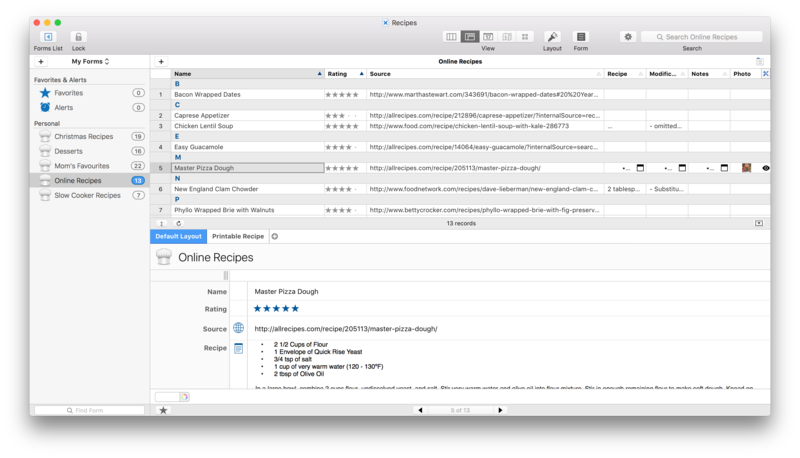 Don’t miss Filemaker a single bit!" Tap Forms Copyright ©2019 Tap Zapp Software Inc.